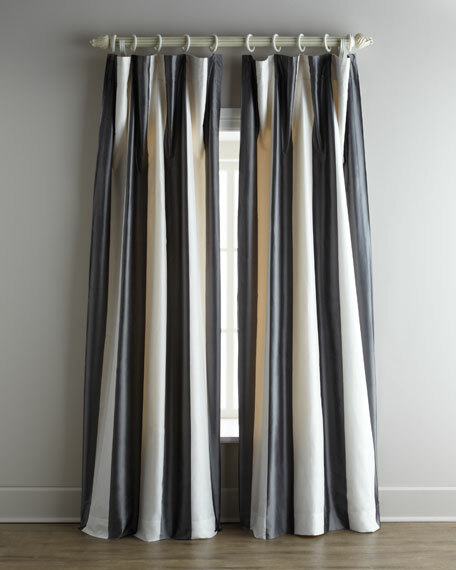 Two-tone striped curtains made of silk and lined with cotton. Each panel, 52"W; 3.5" rod pocket. Seven drapery hooks are included with each panel. How to Measure For CurtainsTo hang panels using drapery hooks, insert the hooks into the pocket or the lining on the back of the panel. For a straight look, space hooks 4"6" apart horizontally across the top of the panel; for a bit of a "swoop" between rings, space hooks 7"12" apart. Silk taffeta with wide sateen stripes; cotton lining.Rod pocket or hang with hooks (included).Each approximately 52"W.Dry clean.Imported.Tieback not included.